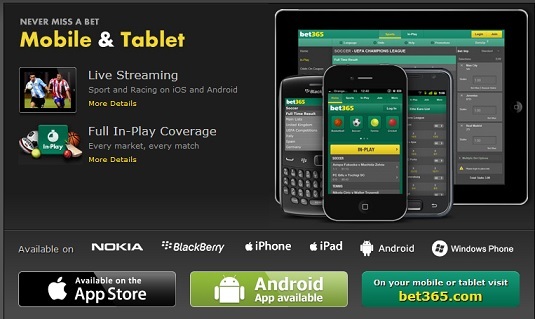 Why choose the Bet365 Mobile App? A must-have for sports betting enthusiasts, the Bet365 mobile app brings the thrills of betting on your favourite sports straight to your iPhone, iPad and Android devices so you’ll never miss out on the action. Featuring live streaming, full-in play coverage, simple account management and many of the same events and betting markets found on the Bet365 online site, the Bet365 mobile application can easily be counted as one of the top mobile betting apps on the market. Bet365 has developed a dedicated app for iPhone and iPad users, which can be downloaded from the app store by searching for bet365. There is also an app for Android users that can be downloaded from the Getjar App Store if you live in the UK, Ireland, Austria, Australia, Canada, Denmark, Greece, Poland, Portugal and a few other countries. 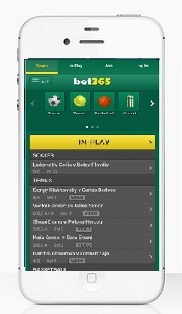 If you live in a country where the app is not available for downloaded, you can always access the bet365 mobile betting site by visiting www.bet365.com from your mobile web browser. 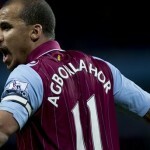 The most popular mobile betting app on the market also happens to come with one of the best bonuses for new customers. When you sign up and download the app, Bet365 will treat you to an incredible welcome bonus worth up to £200. Other great bonuses on offer include Bet365’s 50% Euro Basketball bonus, a mutli-bet bonus on Aussie Football that’s worth up to an extra 65% on accumulators, and a Bore Draw Money Back offer that’s been extended to include first goalscorer, last goalscorer and anytime goalscorer for every 2014 World Cup game. And as if the World Cup isn’t going to be exciting enough, Bet365 is also running a World Cup Penalty Payback promotion that will give you your money back if you place a bet on the To Win Outright market and the team you backed is eliminated on penalties. Not only is the mobile app from Bet365 easy to use, it also incorporates many of the great web features that have made Bet365 one of the leading online bookmakers in the UK and Europe. Add to that an incredible array of promotions and betting guarantees, and you’ve got yourself an app that truly stands out above the rest.